I promise I am JUST about ready to start blogging for myself again! Promise! But haven’t these guest bloggers been great?! 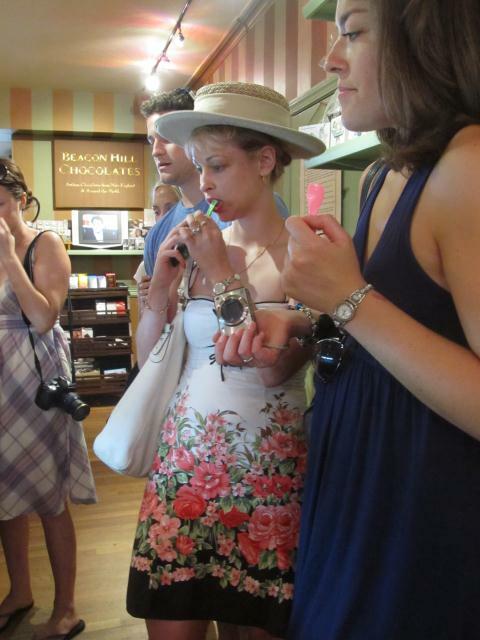 Today my friend Audrey, founder of Boston Food Finds, fills us in on exactly what a food tour is! Enjoy! As I recently conducted a preview Beacon Hill/Back Bay Food Tour for Boston Food Finds, a business I founded last January to showcase the local food industry, a guest asked me an interesting question: In my view, what made for a good food tour? A few years ago, I started to add food tours to every travel itinerary because I enjoy culinary tourism – a fancy term for food tours – and because they added structure and companionship opportunities to solo travel. Since then, I’ve gone on tours in several major cities, including New Orleans, Seattle, Portland (OR), San Francisco, Philadelphia and Portland, ME. Like people, food tours come in all shapes and sizes. Some are walking tours, while others require some means of transportation. Some are very organized, well-paced and bring good value for money. Others…well, not so much. Each tour is indelibly etched in my mind for different reasons. The Seattle tour guide was named Eric, a young, married father who decided a few years ago that he no longer felt comfortable wearing pants. With ponytail, kilt and pink umbrella – lest we lose sight of him – he led our tour through the streets of Seattle, including the ever-popular Pike’s Market. Eric is simply an outstanding tour guide. In fact, he’s been written up in the local Seattle press, and has his own YouTube video. The Portland, Oregon tour was led by a part-time actor/tour guide, who has seemingly found his calling. The afternoon tour exceeded expectations, starting with rich, drinking chocolate at an upscale, small chocolate shop, Cacao, and ending with the talk of the town, Voodoo Donuts. 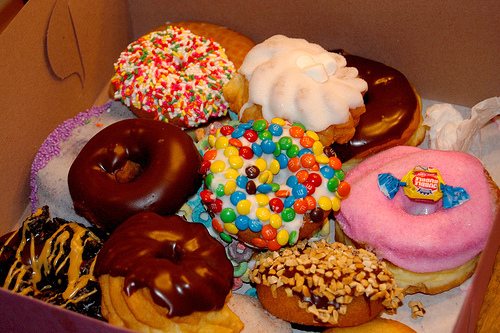 Voodoo, that is, of the infamous Tums-topped donuts. (If only the FDA hadn’t caught wind of it). The New Orleans tour was led be a chef/tour guide, whose claim to fame was having worked for Emeril Lagasse. The tour began in the over 170-yeaer-old Antoine’s restaurant, a French Quarter treasure, where many a celebrity has dined, as documented in the hundreds of framed, autographed photos that line its walls. While Antoine’s was an unforgettable walk through history, my favorite part of the tour took place a block away in the closet-sized back room of a small kitchenwares store, where our host demonstrated the art of making a perfect roux for gumbo, a true labor of love if there ever was one. And so what makes for a good food tour? Tour guides who are passionate and knowledgeable about food, and genuinely love their jobs. Tour partners who welcome tour groups warmly and enthusiastically, and provide them with a memorable experience. And, lastly, the main attraction: the food. It should be the best of what a city has to offer, reflecting a balanced mix of its history, as well as contemporary food trends. I hope that my travels throughout the past few years have enabled me to flavor Boston Food Finds’ food tours with the best culinary experiences that our city has to offer, and that you’ll join us on one of our tours in the near future. Audrey Giannattasio is the Founder of Boston Food Finds, which conducts local food tours. To learn more about Boston Food Finds, or to sign up for food tour alerts, go to www.bostonfoodfinds.com. This entry was posted in Reviews, Travel in New England and tagged boston, boston food finds, culinary, culinary tourism, food, food tour, tourism, travel by reneeh. Bookmark the permalink. This is a lovely post! I’m hungry and ready to travel!